It is usually the custom on Sundays for most people to carry themselves to whatever religious institution they choose to worship. Some people take a rest on Sunday, it worked for God after all. For this twenty-something Chicagoan it had been a common practice to sleep in until at least noon (often times sleeping off the hangover acquired from the previous night’s exploits). But for whatever reason this was not the case this particular seventh day of the week. As I sipped my coffee I perused the local paper. As I looked around at the headlines I thought what better way to slide into a city then by thumbing through some of its history. With the division of sides (such as Northside and Southside), counties, and towns (ex. China town, Greek Town, etc.) it may be hard for some groups to be able to clearly track their influence within the city. This is why 4-Star thought it’d be a good first showcase to do a write up on the DuSable Museum of African American History. Starting out as a small historical display in founder Margaret Burroughs’ home, the museum since its creation has made it a mission to display key historic artifacts and [via their website] “achievements of people of African Descent.” While walking through the passageways of the small multi-level museum the patron can get a chance to learn some “not-so” common knowledge about the cultivation of Africa, leading into migration to places such as Brazil and other South American countries, small Caribbean islands, and eventually leads to the settling of early Chicago. I got a chance to learn a fun fact that I, as an almost 25 year old African-American native Chicagoan, was a little surprised I did not know. The museum borrows its name from the first non-Native American settler in the Illinois area Jean Baptiste Point du Sable, a man of African descent, who had hopes of starting a small trading post to generate some business. I think it would be safe to say that some 280 odd years later Du Sable’s hope to get a little cash in his pocket was a success as we enjoy what is now modern Chicago. 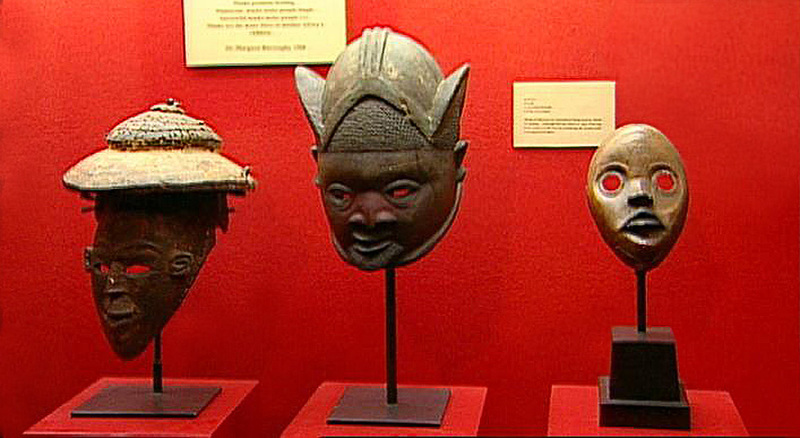 When you first walk into the museum you are presented a beautiful display showing some of the first origins of African civilization. There is a handy guided tour kiosk showing an interactive digital tour of different sites in Egypt. From the pyramids of Giza to secret chambers of a pharaoh’s tomb the information is plenty and the eye-catching graphics will lead you to believe you really did take a trip to the Nile. It’s important to mention the artfully done murals of famous African leaders, dignitaries, and warriors. As the deeply tan faces stare back into the patrons’ eyes it is important to digest the fact that much about the mainstream perceptions of people such as Cleopatra, Queen Hatshepsut, and King Tut have been skewed in believing that these figures were “fairer” in appearance. Some of the other notable exhibits currently showing are Red, White, Blue and Black: A History of Blacks of the Armed Services and Word, Shout, Song: Lorenzo Dow Turner. Red, White, Blue and Black chronicles the scarcely mentioned presence of blacks in various wars such as the [American] Civil, Spanish-American, World Wars I and II, and even the Revolutionary. Filled with factual placards and bursting with memorabilia this exhibit is sure to bring a tear to any veteran’s eye. So bring our favorite servicemen and get there quick! Word, Shout, Song follows the career of Lorenzo Dow Turner linguist, professor and most famous for his documentation of the Gullah language stationed in South Carolina as well as its connection to Afro-Brazilian and West African roots. The display walks you through different celebrations and rituals of the Gullah people and also highlights important events and people in Turner’s life. Located down stairs near the rear exit of the museum this is seen as sort of an end to the museum. But without a doubt the “treasure” of this Chicago museum as well as a clear favorite among us at 4-Star is the Slow Walk to Greatness: The Harold Washington Story exhibit. The lighting bright, reflecting on a soft blue backdrop makes you do a quick double-take at a man sitting at a desk, for a second if you were to squint your eyes or in mid-conversation you’d think it was Harold Washington sitting and narrating his own life himself. In a scene that took me back to my fearful childhood years of the moving mechanical puppets at the national chain Chuck E. Cheese’s, I watched as the animatronic likeness of Harold Washington took me through the life and times of Chicago’s first black mayor. The accompanying placards gave me insightful information on Washington’s State and Congress representative career. The man did a lot in his lifetime before he came to be known as this great city’s mayor including a stint in the military. 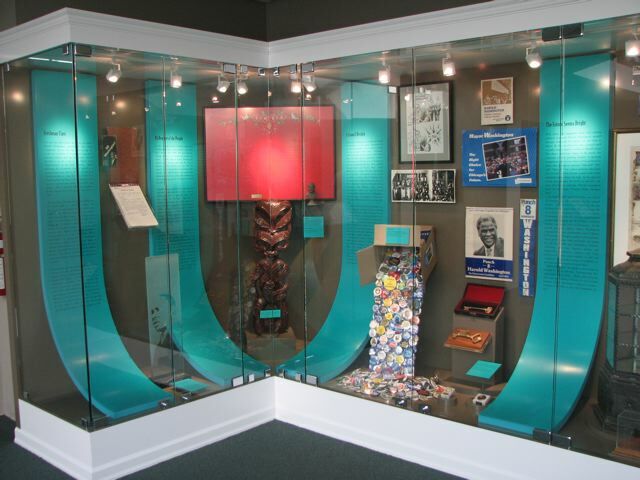 The exhibit boasts over 150 personal, political, and varying artifacts all pertinent to Harold Washington’s career. From his famous desk, to clips of his magnanimous speeches, to materials covering the “Campaign Wars” you will not live that museum feeling anything less than pride in our fair city. 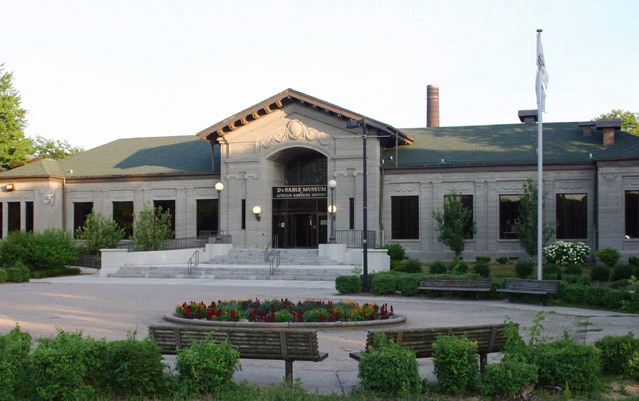 4-Star would like to stress that the DuSable Museum is a great attraction for any Chicagoan or tourist seeking to get an in-depth look into history. With colorful attractions and ever-changing exhibits there is always something new learn and take away. It’s good for group or solo trips so grab the kids (especially grab the kids!) and head out for a nice afternoon out. Before we at 4-Star sign off we would like to leave you with some inspiring words from founder, Margaret Burroughs, in her poem What Will Be Your Legacy? *please note that flash photography is not allowed in the DuSable Museum.